The Android operating system is written and developed by Google, and can be used for your web host. It has its own store where you can purchase and download apps, some of which are free. The Android store is called the Play Store. There should be a Play Store icon on one of the home screens on your smartphone or tablet. The best place to find apps for your Android device is in the Play Store, where both free and premium apps are downloadable over Wi-Fi or a cellular data connection. Some control panel apps are not available in the Google Play Store. These apps are written by third-party developers who do not want to use the Play Store system to distribute the apps they write. You can find these apps by doing an Internet search for Android apps for whatever control panel you use. Generally, the sites with these apps give you a link to download the apps and normally give you installation instructions. The installation process often requires you to go into a special section within the Android settings called the Developer settings; there you have to disable the function that requires apps to be installed from the Play Store. Google provides this function so that you are not limited to acquiring apps from only the Play Store; at your own risk, you can add your choice of apps from anyone and anywhere. Be cautious about installing apps from sources other than the Play Store. You will often find that developers who do not upload their apps to the Play Store have not done so for a reason. Some developers do naughty things with their apps, and those things may come as a shock to you after you install the app. For example, an app may access information that you would normally expect an application to access, such as e-mail addresses, phone numbers, or phone usage information, but the app then sends the information back to the developer. Some apps may plant viruses on your device, which enable the developer to steal information such as bank login details, Social Security numbers, and dates of birth. The viruses can also hide in the system and perform other functions for the developers, such as turning your device into a machine that runs attacks on websites, such as a distributed denial-of-service (DDOS) attack or sending out spam. That said, there are legitimate developers out there who write good applications that are trustworthy, and they might have legitimate reasons for not uploading their apps to the Google Play Store. Make it part of your search to look whether other people have experienced problems after installing third-party apps. If you read bad reviews, you may be warned away from malicious applications. It is possible for something untoward to sneak its way into the Play Store, although it’s unlikely. It’s always a good idea to read reviews of the apps you get from the Play Store to make sure other people haven’t reported problems. Open the Google Play Store using the icon on your home page or in the settings. Use the search box at the top of the screen to search for the app you’re looking for and tap on the magnifying glass. Google Play Store searches for the keywords that you typed and brings up a list of apps that match some or all of those keywords. Select your chosen app from the list to open it. Scroll down to get more information about how much the app costs and what it does. If you want to install the app, look for an Install button at the top of the screen. 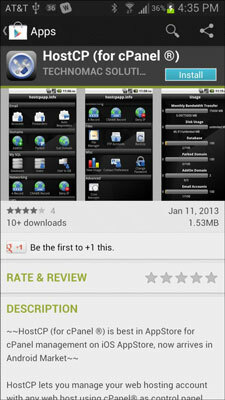 Tap the Install button and the software downloads to and installs on your device. The icon to access the app is placed either on one of your home screens or in your app list. Installing the app is only half of the process; you also must give the app permission to make changes to your server. Don’t worry, though; it’s easily done. All you need to do is type in the address of your website (http://mywebsite.com) and your usual control panel login username and password.